First things first, you need to choose a “homebase” location. I recommend Osaka, because it has a great nightlife and is between all these locations. Alternative is Kyoto, there is so much to see in Kyoto, so it doesn’t hurt to be able to stay there in the evenings. Second, you need a rail pass if you want to go to more than one place. JR offers great deals for tourist and there are different options depending on what you want to see. If you want to focus on Kansai Region only, I recommend buying a Kansai Area Pass or better yet Kansai Thru Pass. The first one covers JR trains but not subways, the second one doesn’t cover JR trains but most other private lines and has a better connection to Kyoto, since you can take Hankyu-Kyoto-Line to Kawaramachi Station which is near the Nishiki Market. JR Trains only go to Kyoto Station, which is far away from all the temples and the city centre. 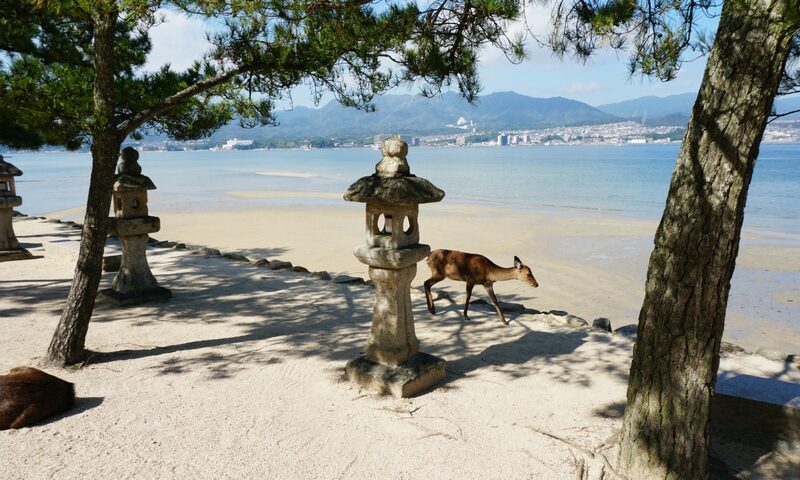 If you want to go to Hiroshima, I definitely recommend buying a Kansai Hiroshima Pass, which is valid 5 days and allows you to take JR Trains and Shinkansen to Hiroshima, as well as a ferry to Miyajima and the Hiroshima Tourist Bus “Meipuru-pu”. It is a really great deal, although you cannot use the subway lines. Alone the Shinkansen is worth it! If you are staying in Osaka, make sure to look for a place near the Umeda station. If you stay near Namba, you will have to go to Umeda Station every day, except for when going to Nara. Namba JR Station doesn’t have good connections to Kyoto or Kōbe. Homebase is Osaka, meaning you stay there for the night and do sightseeing there in the evening, while visiting other cities during the day. You will need to take a train to Fushimi-Inari and back to Kyoto Nishiki-Market or to Gion. The Shrines and Temples are located near each other, so it is possible to go from Gion to Kiyomizu-dera on foot (if you are as crazy as I am) while seeing as much as you can on the way. DAY 5: Take a Shinkansen to Hiroshima, starting with going to Miyajima in the morning and returning to Hiroshima for sightseeing at noon. I intend on posting about each location in detail, let’s see how it goes. Yeah, it’s a crazy tour, but I don’t want to miss out on anything. We have been to Kyoto, Nara and Osaka before, so this time we tried to go to other places while repeating some of the old tour for my mom. Luckily, Japan is small and the train system is great, so it was easy to go to all these places. There is just so much to see on every corner. I feel like even 5 years won’t be enough.